There’s a lot of amazing things going on in your body during a workout session. When you exercise, your body increases its production of serotonin, endorphins and dopamine - all of which are powerful mood boosters. Dopamine, in particular, has been found to make us feel more alert and motivated. This is exactly why it pays to take that 20-minute walk during your lunch break instead of scrolling through your social media feeds. When your body gets the rest it needs on a regular basis, you’ll have the energy to get through your busy day - and maybe even some to spare! Working out at night can make it very difficult to wind down and get a restful sleep. Experts recommend avoiding vigorous exercise within 3 hours before bedtime. For those with especially busy schedules, this can be a challenge since it may be the only time of day they can fit in a workout. If, after increasing your exercise efforts you’re (still) feeling lethargic or are having difficulty sleeping, there’s a good chance you may be overtraining or something else might be going on. 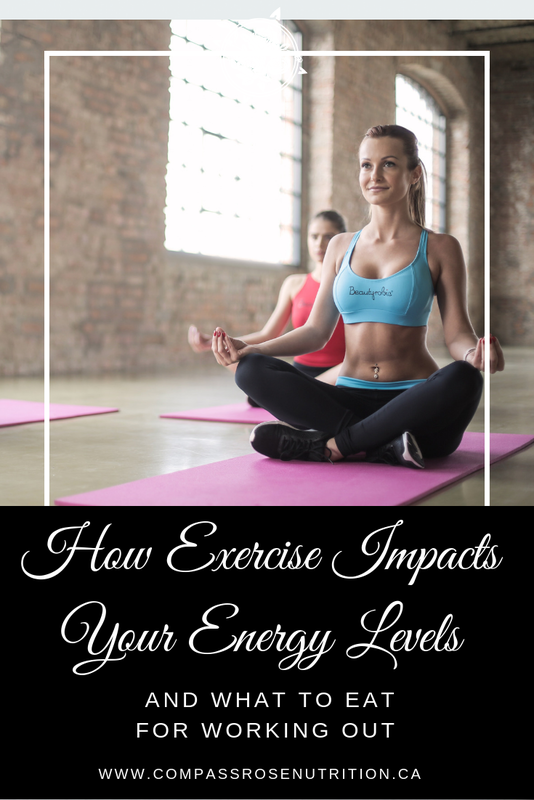 One more thing about Exercise & Energy - the food you eat also plays a huge role in your energy levels! In addition to getting regular exercise, be sure to fuel your body with whole foods throughout the day to keep your energy levels up and maintained. When you feed your body with the right nutrients before your workout, you’ll be able to lift more, run longer, faster and feel so much better doing it! Just plain water will do the trick during your workout. Experts recommend drinking between 3-8 oz of water every 15 minutes during your workout session. Also, you can hold off on the sports drinks unless you’re exercising for 90 minutes or longer, or are exercising in extreme heat. Sports drinks help to replace carbohydrates and electrolytes but are not necessary for the average gym goer. PLUS, they are FULL of sugar and strange color concoctions that we know are not good for you. If you want to make up your own, healthier workout drink, just grab a ½ cup pure orange juice, top with filtered water and add a pinch of sea salt or pink salt. You’ve got a DIY electrolyte replacement drink for a fraction of the cost and infinitely healthier. It is recommended that you eat your post-cardio snack 30-60 minutes after finishing up.